Here is something that you can give instead of a box of chocolate for Valentine's Day or a Hong Bao (red envelope) for Chinese New Year. 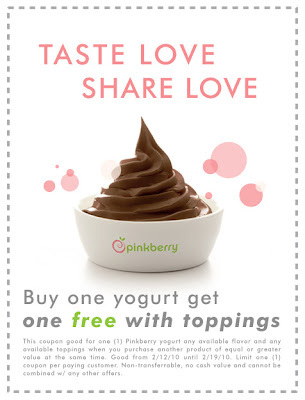 Running again this year is another "Buy One, Get One Free" coupon from Pinkberry. The yogurt shop that rises to the top during the days of Atkins's diet (coincidentally watching Krispy Kreme taking a noise dive at the same time), are offering their loyal customers a freebie with a purchase of the same item. A little add-on this time around... free toppings on your free yogurt. Any available toppings according to the coupon. Hence, don't be surprised if the yogurt shop mysterious ran out of mochi or something like that. Get them while it last as offer ends Feb. 19.